Compute Engine provides virtual machines on demand. With Compute Engine, you can do large-scale computational work and achieve high performance. It is useful to be able to communicate bidirectionally between virtual machines on Compute Engine and remote machines, such as a local personal computer. This document uses JMeter as an example of this scenario and explains how to configure SSH port forwarding to enable the bidirectional connections. With this technique, you can set up a JMeter server cluster on Compute Engine for load testing and control the cluster from a JMeter client, running on your local personal computer. Verifies that your system serves the expected number of users/requests. Allows you to monitor the server’s behavior and responsiveness under high stress conditions. Exposes potential bottlenecks in your system. This document presents an efficient way of setting up a distributed load test environment with JMeter on Compute Engine instances. This document provides a detailed description of how you can set up a JMeter load test environment to run load tests on Compute Engine. It assumes you have a technical understanding of networks and requires some familiarity with Compute Engine and its gcloud command line tool. Although this document describes how you can set up a JMeter test environment, it doesn’t go into any detail about JMeter itself. Building a test plan and executing tests on JMeter are outside the scope of this document. The following section introduces the basics of load testing and JMeter, and the next section dives into some specifics of using JMeter with Compute Engine. A common feature of load testing software is the ability to automatically generate loads against the server. The load test system can simulate a large number of simultaneous user requests. It can also record responses from the servers and gather statistical information about them. The challenge of load testing is creating a large enough number of requests to stress the tested server. In many cases, load tests running on one computer alone cannot generate enough load, so multiple computers need to be orchestrated to increase the load to the server. This tutorial shows you how to set up a JMeter server cluster on Compute Engine instances. By setting up the JMeter server cluster on virtual machines provided by Compute Engine, you are freed from the maintenance of physical servers, and it provides flexibility of the number of instances you start for your load testing. JMeter is a generic framework, and the target system of the load test can reside anywhere the JMeter cluster can access. It can be an App Engine application or any system that resides on Compute Engine, on-premises servers, or another cloud platform. The actual performance can be affected by many factors, including network performance. To accurately measure performance, an isolated system is required. As a result, this system is not regarded as a performance test environment. JMeter runs on Windows, macOS, and Linux. It supports various protocols for testing and provides a visual UI (User Interface) for configuring the load tests. The JMeter client is the workstation running the JMeter UI. The JMeter servers can sit elsewhere on remote servers (Fig. 2). You can mix server types in the configuration. For example, your Mac can be set up as the JMeter client and Linux servers as JMeter servers. To simulate an actual load situation, the test scenario must be carefully built in such a way that the system can mimic the behavior of actual users as closely as possible. To use a JMeter distributed setup, first list all the JMeter servers in the configuration file of your JMeter client remote_hosts entry in bin/jmeter.properties. To start the tests, use remote start all instead of start. When you use the remote start all command, the JMeter client connects to all the remote JMeter servers listed, starts running tests, and receives all the results. 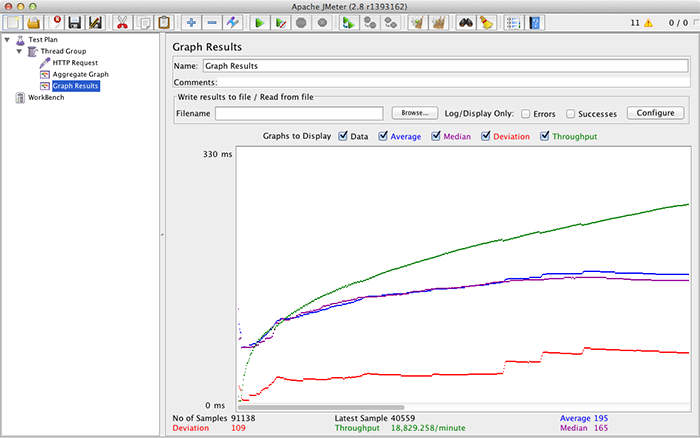 During the load test, results from all servers in the JMeter cluster are sent to the client. 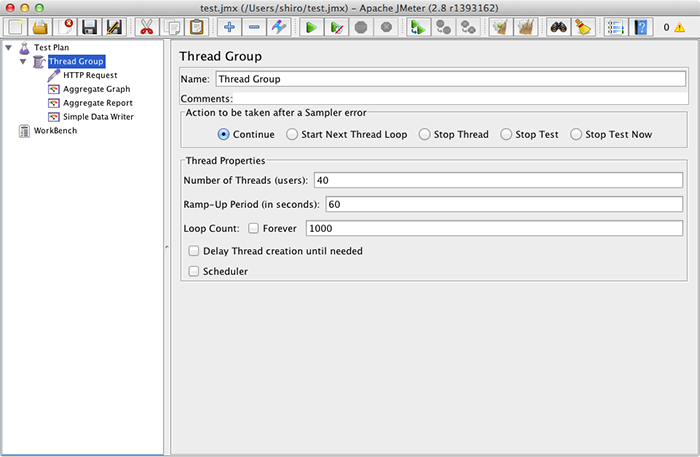 Results are consolidated and shown on the JMeter client screen (Fig. 3). JMeter is equipped with other kinds of result handlers in addition to the one shown. The rest of this tutorial discusses how to configure JMeter Servers on Compute Engine. This tutorial assumes you will set up multiple JMeter servers on Compute Engine Linux instances and run the JMeter client on macOS. When the JMeter client remotely starts the test, communication between the JMeter client and the JMeter server is established via the JMeter connection and Java Remote Method Invocation (RMI). The JMeter connection is always initiated by the JMeter client. The TCP connection for RMI, on the other hand, is started in both directions. This results in the creation of a total of three connections (Fig. 4). 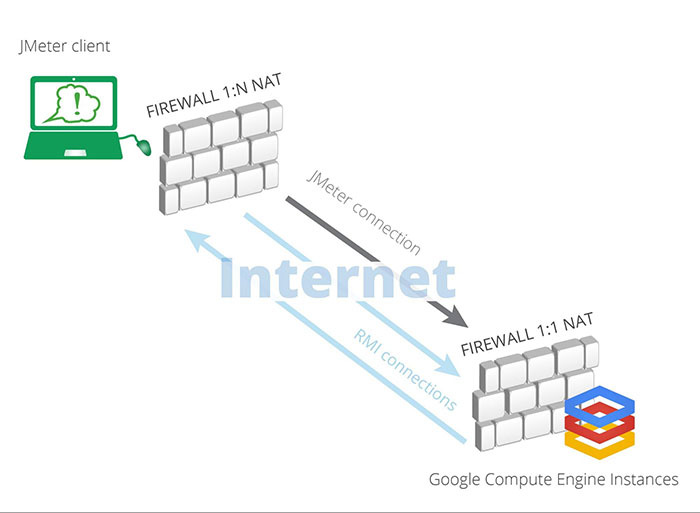 It can be challenging to configure the connections when the JMeter client is running behind a firewall using 1:N NAT (Network Address Translation) and is connected to JMeter servers on Compute Engine, which are also behind a firewall. Compute Engine uses 1:1 NAT for its external IP address. Each Compute Engine instance uses its internal private IP address as its IP address. This prevents the JMeter remote server from being able to connect to the JMeter client because the client is behind a firewall and has no public address. The client, on the other hand, cannot connect to the remote server because the server reports its internal private IP address as its public address (Fig. 5). 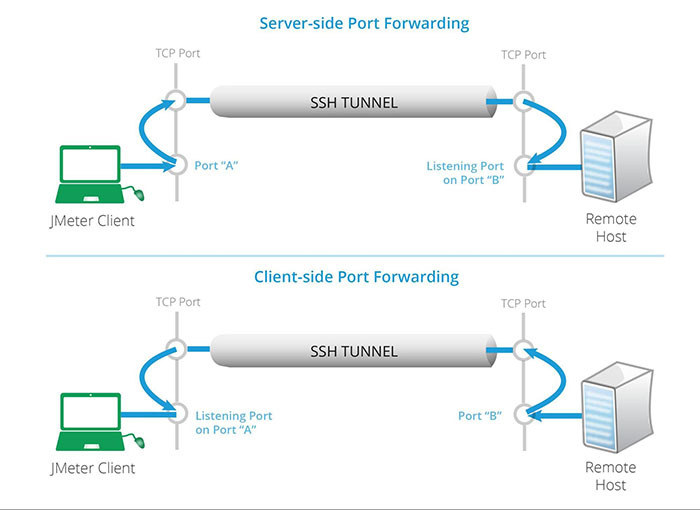 Secure Shell (SSH) has a functionality called SSH port forwarding (or SSH tunneling), where a connection is forwarded to a different port where the actual communication is made on the SSH connection. The port forwarding can be done either on the SSH client or the SSH server side. With port forwarding, you can set up ports that allow the JMeter client and server to connect to each other. Note that “A” and “B” in Figure 6 refer to port numbers. To set up server side SSH port forwarding as shown in the examples above, you would execute the following command on your client machine (-L indicates local and -R indicates remote). Similarly, the following command sets up the client side port forwarding. On Windows, you can configure SSH port forwarding by using PuTTY from “Connection” - “SSH” - “Tunnels” of PuTTY configuration in a similar manner. The example command below sets up forwarding for 3 ports. You might want to add the -N option to only forward ports and the -f option to run ssh in the background. To use the proper port numbers, all that is left to do is to configure the JMeter client and server. The previous section discussed port forwarding for the JMeter connection. Here, specify port 24000 of the localhost (127.0.0.1) as a remote host and specify the client RMI listening port to 25000 because that’s the port number that the RMI connection from JMeter server is forwarded to. Because you will send massive amounts of requests from the JMeter servers to the target system, you don’t want to send back an equal number of results to the JMeter client. So, you will need to set data transfer to a “Statistical” mode. The statistical mode specifies that statistical information is sent from the JMeter server, resulting in a reduction of transfers between the JMeter server and client. Otherwise, the JMeter client would be the bottleneck of the load test. For more details about the configuration, see the JMeter document. These settings tell the JMeter server to bind to port 24000 for the JMeter connection and port 26000 for server-side RMI listening. Finally, when starting the JMeter server on a remote Linux box, you will need to tell JMeter to use localhost (127.0.0.1) as its RMI server. This command starts the JMeter server on the Linux box and accepts a connection from JMeter client. Then, you can start JMeter client again, specifying localhost as the RMI server. Note that on Windows you will need to use bin/jmeter.bat. You can create test cases using the JMeter UI, as usual. 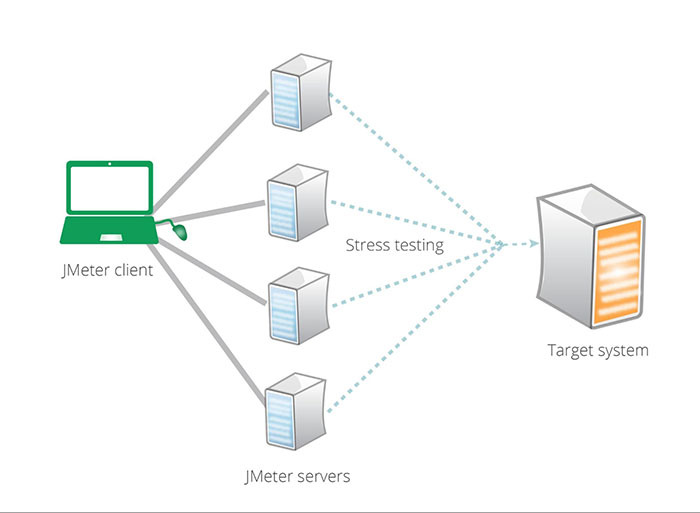 The JMeter client automatically recognizes the remote JMeter server, issues the remote start all command to initiate a connection with the JMeter server, and starts sending requests from the remote JMeter server to the target system being tested. Because a Compute Engine instance works as a regular Linux machine, no special configuration is required. However, the easiest way to connect to it with SSH is to use the gcloud compute ssh command rather than the vanilla ssh command, because gcloud compute ssh pre-sets some options for connecting to Compute Engine. With the gcloud compute ssh command you need to specify the -- option to pass parameters to ssh. Note that an -L or -R argument must be combined with the parameter that follows it, so they are passed as a single parameter to ssh. Otherwise, the parameter is interpreted as a parameter for gcloud. So far, you have seen an example of how to successfully set up the JMeter server on the Compute Engine instance. However, the main objective of using remote JMeter servers is to enable a single JMeter client to orchestrate multiple JMeter servers to stress the tested server in such a way that would otherwise be impossible to achieve with a single computer. If the JMeter client and JMeter servers are on the same side of a firewall (for example, they’re both on-premises at a company), all the JMeter servers can use the same port. However, this example enabled SSH port forwarding, so each server needs to be configured to use a different forwarding port and corresponding RMI listening local port. All servers can still use the same number for the RMI port to connect to the client, like 25000, as was the case in our example. Note that the example presented in this tutorial specified port numbers of 24000, 25000, and 26000, where the maximum number of servers is 1000 to avoid an overlap of port numbers. If your cluster has more than 1000 servers, you would need to use a different set of port numbers with a larger gap between them. Tear down the JMeter server cluster when it’s no longer needed. Here is an introduction to the sample implementation of such a script, jmeter_cluster.py. The sample application is available on GitHub. The JMeter server package includes pre-configured jmeter.properties in the “bin” subdirectory. However, port numbers must be customized per instance. The startup script will overwrite the port numbers for you. Startup script downloads JMeter server package from Cloud Storage. Startup script modifies port numbers in JMeter configuration based on its server ID number in the cluster (0, 1, 2, …). The server ID is passed to each instance as custom metadata of Compute Engine instance. Startup script starts JMeter server process. Runs gcloud compute ssh commands to setup SSH port forwarding. Updates server list as a remote_host JMeter configuration. Starts JMeter client on local machine from JMeter client package. Starts up a cluster that consists of [cluster size] number of Compute Engine instances. Also sets SSH port forwarding. After running the start command to start the JMeter server, run the client command to start the JMeter client. Sets SSH port forwarding for [cluster size] number of instances. This is required only when the terminal that started the cluster loses connection to the instances which, in turn, cancels SSH port forwarding. After running the portforward command to re-establish port forwarding, run the client command to restart the JMeter client. Starts JMeter client on the local machine. Tears down the JMeter server cluster.